abbreviation for sinoatrial node. See sinus node. 1. A knot, knob, protuberance, or swelling. 3. A small rounded organ or structure. A node of specialized cardiac muscle fibers in the lower interatrial septum that receives impulses from the sinoatrial node and transmits them to the bundle of His. 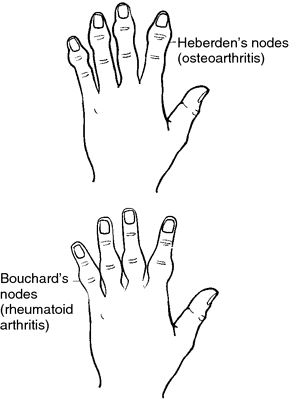 In osteoarthritis, bony enlargement of the proximal interphalangeal joints. A cluster of immunologically active cells inside a malignant tumor. The node may represent an attempt by the body to destroy foreign antigens on the tumor cell surface. Joint swelling seen in rheumatoid arthritis. A small encapsulated lymphoid organ that filters lymph. Lymph nodes are found at junctions or branches along the lymphatics. They provide sites where immune responses can be generated through the interaction of antigens, macrophages, dendritic cells and lymphocytes. See: illustration; immune response; inflammation; lymph; lymphocyteLymph nodes are 0.1-2.5 cm long kidney-shaped aggregates of lymphocytes and macrophages embedded in a meshwork reticulum composed of thin collagen fibers. At each lymph node, an artery enters through a surface indentation (the hilum) alongside an exiting vein and an exiting (efferent) lymphatic vessel; a number of afferent lymphatic vessels enter the lymph node at other sites. Inside lymph nodes, lymph slowly flows through endothelial sinuses lined by lymphocytes and macrophages. Macrophages remove macromolecules, particles, debris, and microorganisms from the lymph stream. Lymphocytes and antibodies move through the walls of the sinuses and into the passing lymph, while dendritic cells pass from the lymph into the lymphatic follicles, carrying antigens from the body's epithelia and from infected tissues. In the cortical region of the lymph node, the sinuses wind around lymphatic follicles, which are ovoid germinal centers packed with differentiating and proliferating B lymphocytes and surrounded by loose T lymphocytes. 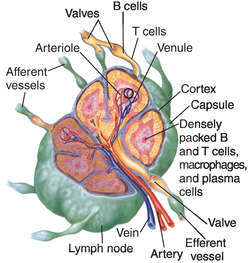 Lymphocytes and antibodies also enter and exit blood capillaries throughout the lymph node. Lymph nodes are most numerous in the neck, mediastinum, abdominal mesenteries, pelvis, the proximal limbs (the axillae and the groin), and along the posterior abdominal wall. Inside the chest and trunk, lymph nodes tend to be found along the veins near viscera. A knoblike structure at the anterior end of the primitive streak. 1. A lymph node that receives drainage from a tumor and is likely to harbor metastatic disease before cancer cells have the opportunity to spread elsewhere. A specialized group of cardiac muscle cells in the wall of the right atrium at the entrance of the superior vena cava. These cells depolarize spontaneously and rhythmically to initiate normal heartbeats. Circumscribed swelling at the end of long bones due to congenital syphilis. The nodes are sensitive and painful during inflammation, esp. at night. Since the original description given by Keith and Flack (1907), the SA node has been known to have a special arterial supply. When a single artery supplies the SA node, there is more chance of ischaemia leading to sick sinus syndrome. Futami et al reported 23% incidence of dual irrigation to SA node in Japanese population. In our study, the artery to SA node was single in 70 hearts (93. Caption: Problems with the SA node (circled), the heart's natural pacemaker, can cause the heart to beat more slowly--a condition known as bradycardia. SA node lies at the antero-lateral region of the junction of superior vena cava and sinus intercavarum with both right atrium and auricle near the upper end of sulcus terminalis. On cross section, SA node is triangular with a disproportionately large central artery. Three preferential path ways - upper, middle and lower / anterior, posterior and middle-connect SA node with AV node. Fibres are slightly thicker and shorter than those of SA node. Firstly, isoflurane may have less effect on the rate of spontaneous discharge on the SA node than Halothane. These finding are in accordance with the observations of Bosnjak and Kampine (10) who demonstrated that volatile anesthetics alter the heart rhythm by influencing the rate of discharge of SA node. Effects of halothane, enflurane and isoflurane on the SA node.